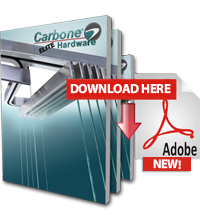 In Carbone Costa Rica we have introduced our new product line, Carbone Elite Hardware for tempered glass. It is a new skirting technology for fixed panels with stainless steel covers. As well, a system of sliding doors with soft closed, and one or two doors of simultaneous opening. We also have doors with fixed panel installation, which can be installed on walls or glass walls. Elite Glass Locks, stackable sliding system with hardware, stackable sliding system with stainless steel baseboards, locksets, glass door doorknob , entrance locks, glass door hinge, aluminum profile with integrated rubber packaging for door seal, high quality square lock, entrance door, sliding door for hall and lock cylinder spare parts. You can see a demonstration of our door systems on our YouTube channel.